Plantable Booklet Invitation made from tree free, handmade papers with real, plantable MIX of WILD FLOWER seeds. BEE-friendly, perfect for a Green Wedding. Wild flower seed mix includes: Black-eyed Susan, Sweet Alyssum, Spurred Snapdragon, Birdâ€™s Eye, Baby's Breath. Mix chosen to support Bee Colonies. Original custom artwork letterpress printed on cover. 100% rag cotton white envelopes. 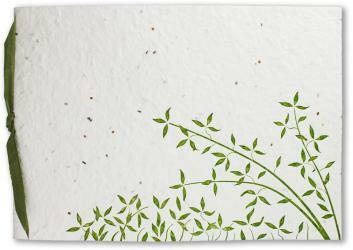 Seedling Wedding Invitations are a DIY kit, you can print or we can print but you assemble. Assembly: Fairly easy. The wrappers are diecut and scored. DIY booklet invitation. Diecut pocket for rsvp set and enclosures. Diecut binding holes as scored for easy folding and assembly. PAPER FACTS: Portfolio wrapper made from recycled cotton rag handmade paper from India. Diecut and letterpress printed by us here in Los Angeles. Inside invitation sheet made from recycled cotton rag paper, made in USA. Envelopes made from 100% cotton paper, made in the U.S.
A charming booklet invitation that opens to a wide landscape of 14 inches. Booklet Cover:Die-cut and scored portfolio wrapper made handmade heavy weight paper embedded with real Wild Flower seeds. Letterpress printed original design. Mailing Envelope:Cotton rag white A7 envelope. Ribbon:Half yard of natural paper raffia per invitation.